Look around you. If you are in an urban or suburban environment, chances are that many of the buildings and other structures in your environment are built with masonry. From concrete block home foundations to elegant stone facades, from contemporary concrete veneers to classic brick buildings, the beauty, strength, and durability of masonry construction enhances our enjoyment and increases the value of the built environment almost wherever we go. Masonry — the art of building with brick, block and/or stone – is nearly as old as civilization itself. Today’s masons carry on a millennia-old tradition dating back to Neolithic times, when elaborate stone cairns began to appear in what is now France. These include northern Brittany’s Cairn of Barnenez, the oldest known building in the world. The ancient stonesmiths who created these dry-built (mortarless) monuments utilized both stone megaliths (large stone slabs or boulders) and smaller stones to create grave mounds containing tombs and passageways. The complexity and magnitude of these ancient structures hints that these prehistoric masons were already drawing upon established traditions within the trade. Perhaps one day archaeologists will uncover structures older still. Brickmaking, too, is an ancient art. The earliest evidence of brick construction dates back to 7,500 BCE in the Tigris Valley near Damascus, Syria. Those ancient bricks were simply hand-formed cakes of clay, mixed with sand and straw, and laid out in the sun to dry. The first recorded use of mortar is found in a site called Mehrgarh in Pakistan, dating from 6,500 BCE. It was used together with mud bricks to build the houses and granaries of this early agricultural settlement. Already, the masonry trade was quietly doing its part to support the lifestyle and industry of the times. In the ensuing centuries, the use of brick, stone, and concrete block contributed greatly to the rise of every great civilization on the planet. The Great Wall of China; the ancient Egyptian pyramids; the Taj Mahal in India; the great stone structures of the Incas and Mayans in Central and South America; the Roman Coliseum; the magnificent cathedrals and mosques of Europe and the Middle East – all were shaped by the capable hands of masons. Many of the basic techniques and materials of the masonry trade remain essentially unchanged since ancient times. However, the trade has embraced advances in technology through the ages. Around 4,000 BC, the brick kiln was invented, along with improved methods for creating uniform bricks. Cast stone is thought to have been invented in the Middle Ages; however there is some evidence that a form of cast stone may have been used much earlier to build some of the Egyptian Pyramids. The Industrial Revolution ushered in the modern era of masonry. At this time, brick manufacturing shifted from hand molding to mechanized production. Steam engines facilitated the quarrying and transportation of units in far greater quantities than previous generations ever dreamed possible. And the invention of concrete block made masonry construction more affordable, opening up new possibilities for architects and engineers alike. Today, we are experiencing yet another explosion in masonry technology. Modern advances in materials science and advanced installation tools and methods are making masonry construction more versatile, beautiful, durable, and affordable than ever. Beauty—It’s hard to beat the timeless appeal of masonry architectural elements. The addition of natural stone or a brick veneer to a residence improves the character of the home and will often raise its market value. In commercial, government and industrial buildings, masonry construction conveys a sense of dependability, trustworthiness, and prosperity, as well as being pleasing to the eye. Masonry products are available in a palette of earth-tone colors, shapes, sizes, and finishes. From polished opulence to rustic charm, you are sure to find a masonry product that will enhance your project. Durability—Imagine building a school with wood frame and vinyl siding. What do you think it would look like in 20 or 30 years? Most likely, it would be in need of major renovation. Masonry buildings, on the other hand, can be expected to last 80-100 years with minimal maintenance because they withstand high traffic areas. This is why contracts for federal, state, and local government buildings nearly always call for masonry construction. 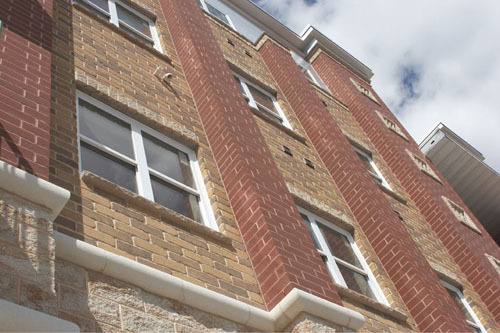 Low Maintenance—Because masonry products are so durable, they require very little maintenance. For example, a properly constructed brick or concrete block exterior wall can be expected to last virtually maintenance-free for a minimum of 50 years. Tuck pointing of weathered mortar will then extend the life of the building for many more decades. 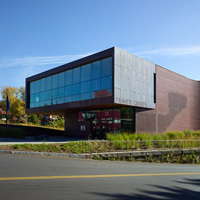 Sustainability—Masonry is one of the most sustainable building material choices available. Choosing masonry products — especially locally produced ones — will often assist in earning LEED credits. Masonry products also typically have a high thermal mass. This superior heat storage ability is used to advantage in many of today’s innovative, energy efficient building designs. Fire and wind resistance—Brick, stone, and concrete masonry products all are recognized as having excellent fire and wind resistance properties. They are often specified in projects where fire resistance is a concern making them a logical choice for multifamily living units, student housing, and hotels. A structure’s ability to continue standing and safely perform its intended function, even in a natural disaster or fire, makes masonry the obvious and safe choice as a building material. Mold and pest resistance—Masonry products are generally inhospitable to mold and insects. They can be an excellent choice in areas where these problems are likely to occur, in combination with proper pest mitigation construction techniques. Affordability—Standard concrete block is not the only affordable masonry option. Despite their high-end appearance, other types of masonry products can be surprisingly affordable – especially when maintenance costs over time are factored in. While natural stone and clay brick are well-known for their beauty and durability, many people are surprised at the variety of equally attractive and cost-effective concrete masonry options available today. Many affordable concrete products offer beauty equal to natural stone and brick, along with improved durability and exceptional ease of installation. Masonry is an indispensable trade. Without working masons to construct important new buildings and perform needed repairs on existing structures, our economic system as we know it would grind to a halt. These days, skilled masons are especially in demand. In the past few years, more qualified masons have retired than are entering the industry. This has resulted in a shortage of skilled brick and block layers and stone workers. While many in the construction industry are expressing concern at this state of affairs, the situation presents a golden opportunity for young people, returning veterans, and other individuals in search of a rewarding career. Even though masonry buildings are everywhere, masonry is not often mentioned to young people as a career option. More awareness is needed about the tremendous opportunities in the masonry trade. For those who enjoy working with their hands, take pride in creating something useful and beautiful, want to avoid hefty student debt, and would like to earn a respectable wage virtually right away, masonry can be an ideal career. To get started in the masonry trade, a person need only attend a 1-2 year technical college masonry program. Generally, a new graduate will start out as a tender, assisting an experienced mason. Starting wages average around $30-35,000 annually; however, opportunities for advancement are plentiful. A good mason can find himself earning $50-60,000 annually just a few years after entering the profession. The past few years have witnessed a growing trend towards recognizing the masonry industry for its important role in society, and supporting it towards continued growth and excellence. For example, the Spec Mix Bricklayer 500 Competition is an exciting event in which master bricklayers from across the country compete for the title of “The World’s Best Bricklayer” — plus over $100,000 in cash and prizes, including a brand new Ford F250 pickup truck. The winners are judged for both speed and craftsmanship. In Wisconsin, the Masonry Technology Foundation of Wisconsin (MTFW), a branch of the nonprofit Wisconsin Masonry Alliance, is a group that raises funds to increase awareness of masonry as a career. They provide scholarships, training and opportunities for students, veterans and other individuals who would like to go into the masonry field. One of these opportunities is the Wisconsin High School Masonry Program, which provides lesson plans and materials to enable high schools in Wisconsin to offer introductory masonry training to students who might not otherwise be aware of masonry as a career opportunity. County Materials is proud to support the masonry industry and masonry education. By supporting the MTFW and sponsoring the Bricklayer 500, the High School Masonry Program, and similar regional and national events and programs, the company is helping to ensure that the masonry trade continues to thrive for many years to come. 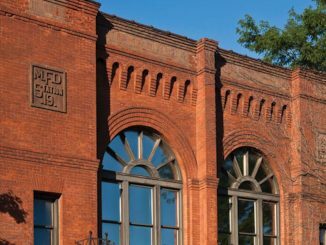 The 2017 Brick in Architecture Awards were presented to 35 winners in 19 states for outstanding and resilient design that incorporates clay brick. 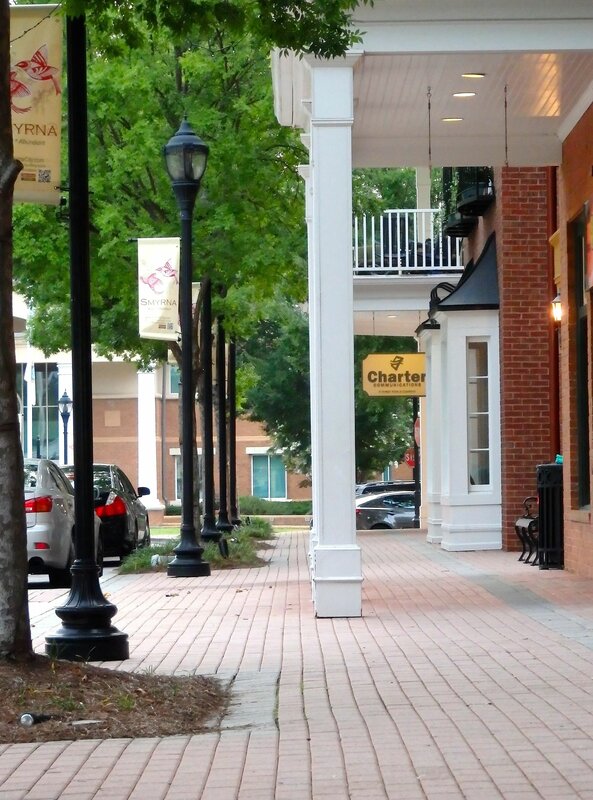 During the last few years, Smyrna, Ga., (the town where I live) has undergone quite a transformation as the city has aggressively pursued new construction and revitalization efforts. To city leadership’s credit, these efforts have not been in vain. Not only does my town look great, but it is winning awards for beautification. Nothing says sustainability more than preserving, restoring and repurposing existing buildings. The greenest buildings today are those already built.